Golden Sea Hotel & Casino was built in a unique composition of Khmer traditional style. It’s a perfect combination of elegant luxury and proximity to Victory beach creates the ideal accommodation for families, business travelers. Natural bungalows along the riverside in beautiful Kampot, Samon's Village is all about a peaceful atmosphere, good Khmer local food, and a central lounge area for relaxation. Rooms & Spa. THE BEST ONE IN SIEMREAP, ANGKOR. This is a new hostel in Phnom Penh, and the first with dormitory sleeping. This 10 storey property captures an enviable location in Phnom Penh. Centrally located to offer easy access to Historical Independent Monument, Olympic Stadium, and the Russian Market, Salita Hotel is also an effortless stroll from restaurants, pubs . The Truly Boutique Hotel in Sihanouk Ville-Cambodia, Kingdom of Wonder ! Sou Ching Hotel is located in an ecologically pure, green, picturesque and quiet part of Sihanoukville, between the center of the city and the Victory beach area. Are you looking for a comfortable temporary accommodation in Phnom Penh Per Night, Weekly or Monthly ? Well, You just found it ! it‘s a pretty guesthouse, Khmer style, nature and culture decoration, top roof garden restaurant with the river view. A deluxe hostel with modern comforts in the heart of Siem Reap's Old Market Area, right next to Pub Street, night markets, spas and massage centers and city sights. The world heritage temples of Angkor are only 15 minutes away by tuktuk. Easy to find from Siem Reap, on the road to the temples, next to Killing Field museum and 7 minutes to Old market and Pub Street with our free of charge transportation. Chenla Guest House offers fantastic rooms designed to suit any budged. 5 minute walk to Old market , All rooms with fan and Air-con private bathroom cable tv , hot water , free breakfast, free bicycle, free internet and Wi-fi, free pick up anytime and free airport transfer. Adventure Hostel Siem Reap is located in the central downtown easily access to many tourist spots with walking distance. We offer deluxe hostel beds with the best rate. The Hotel is well located 5-minute walk from the city center of central Market, Old Market, Angkor Night Market and famous Pub street. And it is 15 minutes drives from Siem Reap International airport and well-known of Angkor. Relax Resort Angkor Villa is a property of Cambodia Dream Co, LTD (REDRICE NETBANK Co, LTD.). We are located in Siem Reap, Cambodia on a quiet side street near the BBU Univercity. 5 minutes walking to Old market, Night market & Pup Street. ALL ROOMS RATE ARE INCLUSIVE OF DAILY BREAKFAST AND FREE PICK UP SERVICE. 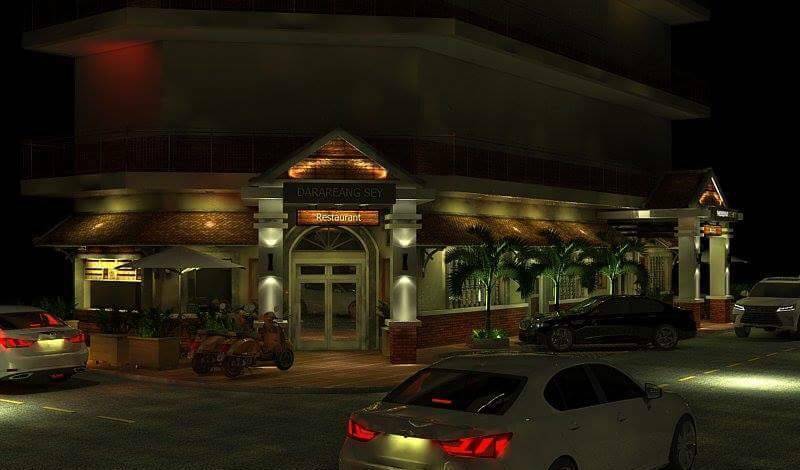 It is located in the center with nearby pub-street, old market, bank ATM. At the hostel, all rooms include a closet. The rooms come with a private bathroom with free toiletries. All rooms are equipped with a seating area. 5 minuets walking to Pub Street, Old market. Bun Nath Guest House offers a warm welcome and provides the very best service to all quests. Our staff is friendly, helpful and always do their genuine utmost to make your stay a happy one. New luxury accommodation for tourists who are looking for a home sweet home at Angkor Wat with the TOP QUALITY of customers service and cares. Im Malis Hotel is centrally located walking distance from the historical heart of the city. 5 minutes walking to Old market, Night market & Pub Street. Welcome in our new, traditional khmer style villa with nice, large balconies and spacious rooms. Come and stay with us in our Angkor home and get to know our Cambodian-Danish family. We are situated inside the Angkor Archaeological Park, halfway between Siem Reap town and Angkor Wat in lush, natural surroundings. Closed Spha samaki market, 10 minutes to old market, Pub street , shopping center, royal park. An oasis tucked away amidst the hustle and bustle of down town Siem Reap. 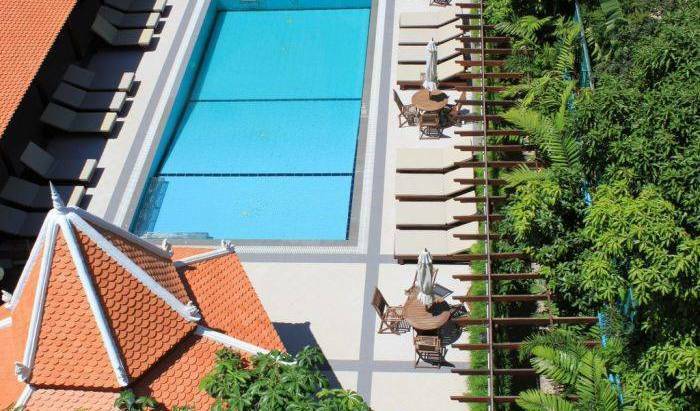 Angkor Parkland Siem Reap is an elegant budget hotel in the heart of downtown Siem Reap! This is a great place to relax after a long exciting day exploring Angkor Temple. Brand new boutique hotel with all comfort in quiet, central location! Adan World is greatest hostel with Bed and breakfast. Located in Central Siem Reap, just a 5 minutes by tuk tuk ride from the Lucky Mall, Old Market, Night Market, and Pub Street. Great Place to Stay in Siem Reap Angkor, Cambodia. Experience all that Siem Reap has to offer in our stylish 3 star hotel. The Ghech Summit Hotel is an ideal base to explore Siem Reap and the magnificent temples steeped in legend and history. Siem Reap White Villa located just a 5-minute walking from the famous Phsar Chas (Old Market) and Pub Street by Sok San street 50 to the west and just a 20-minute from Siem Reap International Airport. The Villa Secret Garden is the ideal place for exploring Angkor historical park, located in the quiet area and about 10 by Tuk Tuk from City. 2 star motel located in nearest to world heritage of Angkor. Lush Tropical, Elegance & Comfort within the Heart of Siem Reap ! Freedom Hotel is located in the center of the town. It is pleased to welcome its customers. Twizt is a socializing and interactive community space provides luxurious and comfortable accommodation with moderate price. Twizt is a vibrated, colorful, and energetic hostel located right in the heart of Siem Reap city. This only accommodation is perfect for the discerning guest looking for a relaxing base from which to explore Siem Reap and experience Cambodian culture. With quiet surroundings 2 big room Bed&Breakfast in old Cambodian house with a big garden. Owners have a warm heart full of information. A home away from home! Located in the Siem Reap City Center provide easy access to Old Market, Pub Street, Restaurants, Shopping & Angkor Night Market. Chez Moi Residence & Spa offers new luxury accommodation for those who are looking for a home away from home while visiting of famous Angkor Wat. Welcome to Siem Reap Angkor, steping back in time to discover the glory of the ancient Khmer Empire and greeted with the best 3 star hospitality in town. Home a way from Home is Prum Bayon Hotel, Kingdom of Cambodia. Step into the Majestic Angkor Hotel and be amazed by the unique Cambodian carvings, hardwood ceilings, floors and decorations throughout the hotel. 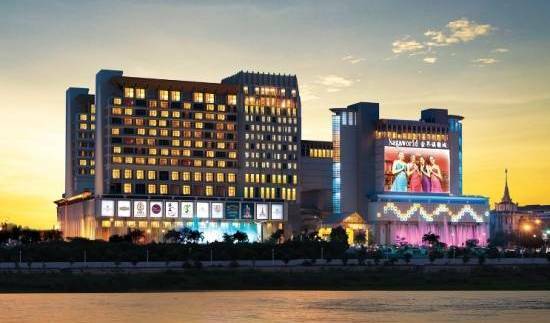 New Angkorland Hotel is an international 4-star, combining one of a kind elaborate hand carved on wood furnishings from the ceiling, on the wall throughout the interior with the most modern elegant Lobby cover with brass logo pattern on the granite floor. Dragon Royal Hotel is the one that serve you as hotel hospitality in Siem Reap, CAmbodia. Enjoy Deluxe Accomodation, the very best of service, Our Modern facilities that will make your stay perfect. Nikkivinsi Boutique Villa is a distinct addition to the city's skyline. From here, guests can enjoy easy access to all that the lively city has to offer. We warmly welcome you to The Frangipani Green Garden Hotel & Spa. 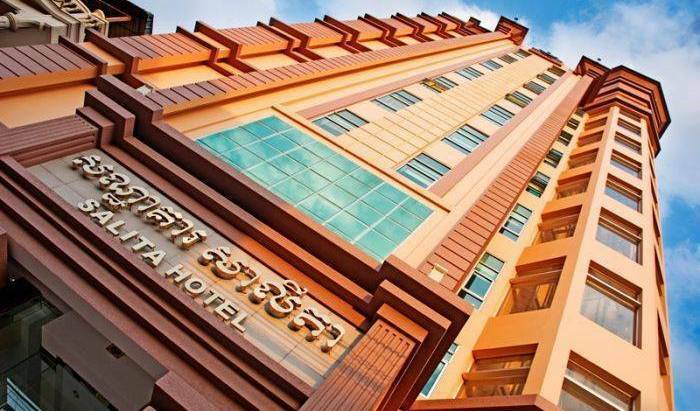 The Sokha Roth Hotel is located right in the bustling center of Siem Reap’s cultural and leisure district , this elegant accommodation is a preferred choice for many. Dyna Boutique Hotel located in city center where guests can make their trips all the more special, plenty of local restaurants nearby and easy accessible to as well as airport and tourist attractions. Angkor Riviera Hotel comprise of 191 modern and stylishly appointed standard, superior, deluxe, family and suite rooms. It is chic for escaping crowd with your beloved in Siem Reap, Angkor, Cambodia. Landing Point Hotel situated in the right center of Siem Reap but away from noise pollution to make your accommodation always at piece. Angkor Empire Boutique is closely to old market and night market on Sok San Road! Angkor Vattanakpheap Hotel offers new luxury accommodation for those who are looking for a home away from home while visiting Angkor Wat. This hotel is located in the heart of Siem Reap town and it is merely 8 minutes drive to Angkor Temples. Only Dara Reang Sey Angkor Hotel is close to Angkor Temples with over looking a nice landscape to flaoting Village, attraction areas.. etc. The Privilege Boutique is the premier boutique hotel in Siem Reap, nestled in the UNESCO World Heritage site of Angkor Wat. Experience ultimate luxury and bask in the splendor of elegance at the Prince D´Angkor Hotel & Spa, the perfect base to explore the legendary Angkor temples and undiscovered treasures in Cambodia. Heart of central area in Siem Reap, Big Container Market, Old Market and Pub Street nearby. Apsara Holiday Hotel Combines traditional Khmer hospitality and style in a modern and comfortable invironment. The Mansion – Siem Reap is the specialist in private villa vacation rentals in Cambodia. Whether you’re visiting Cambodia for a short holiday, extended vacation, or long-term stay. 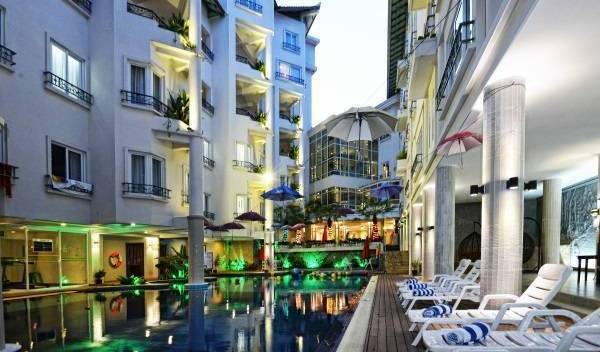 In Miles Boutique Hotel, located in Siem Reap Central Area, Siem Reap, is a popular choice for travelers. A perfect sanctuary to relax and experience the excellent services from our well-trained and professional staff as well as discover the real Cambodian Hospitality and Character. Villa Kiara is an intimate boutique hotel made up of 8 Suites and 9 Deluxe rooms. Experience all that Siem Reap has to offer in our brand new stylish 4 star International hotel. The Tara Angkor Hotel is an ideal base to explore Siem Reap and the magnificent temples steeped in legend and history. The Moon Boutique offers numerous complimentary of services including; daily breakfast, high speed WIFI connection, round trip air-port transfer, shuttle to downtown and local organic fruit in basket set in room upon arrival. The Privilege Floor @Lotus Blanc is located on the first floor of a premier and luxury boutique hotel of Lotus Blanc Resort set right in the center of the historical town of Siem Reap. Escape to a tropical retreat on the serene and secluded with mesmerizing views of local village and unpolluted environment. Lotus Blanc is the only premier 4-star boutique resort ideally situated in the heart of Siem Reap. The 101-room-and-suite boutique resort is characterized by its understated elegance that provides nothing, but the simplicity, nature and classic. Suorkear Boutique Hotel & Spa, Heaven of Tranquility is featured with 15 specious rooms & suites and located in out skirt of Siem Reap city and in the middle of local cultivated village, Sala Kamroeuk- Wat Damnak village, Sala Kamroeuk commune. All rate are included daily breakfast, coffee, tea and pick-up service for complimentory. 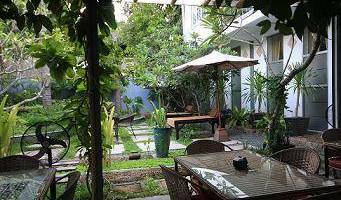 Come and enjoy the total comfort at Hak's House Hostel, a tropical and peaceful garden villa with 26 specious rooms, with friendly Englis Speaking staff. SiemReapRooms Guesthouse is a Khmer/Western run guesthouse which located only 850m from Old market and Pub street. Breakfast and lunch menu, free WIFI, free internet and free pick up available. Smiling Hotel and Spa offer the real standard accommodation in Siem Reap with slogan word as: Your Satisfication is our Priority! Hang Neak Hotel’s Management and Experienced staffs welcome you for relaxing and comfort stay with us. Hotel provides 24 hours services & security at affordable price & modern facilities to serve you. One of the last unexplored paradises in the world. Perched at the foot of a Virgin Rain forest on the South Cardamom Protected Reserve. Free Breakfast Included. Welcome to Salita Hotel, Phnom Penh, a branch new hotel in the heart of the city. Welcome to the new House Boutique, a highly individual hotel, close to the sightseeing hub of Phnom Penh, which marries local style with a sustainable ethos. The G Mekong Hotel is an artistic urban sanctuary that embraces contemporary design, stylish comfort and metropolitan luxury.